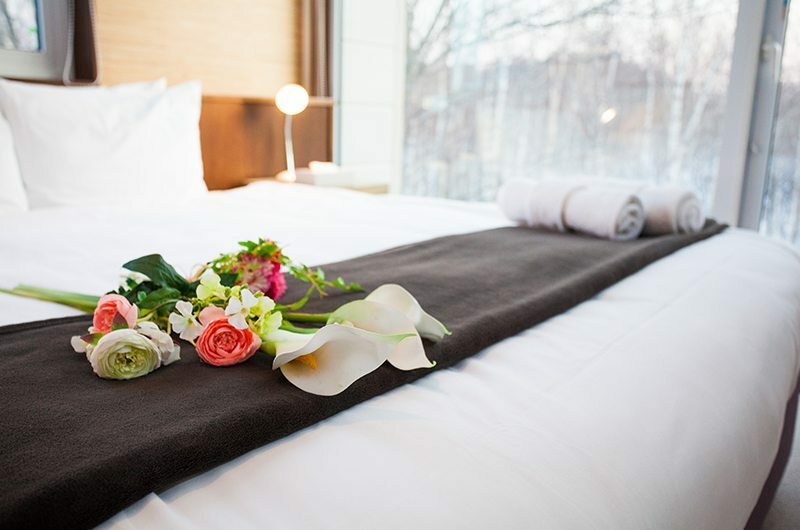 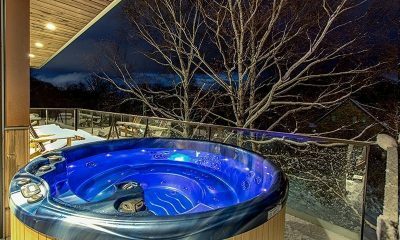 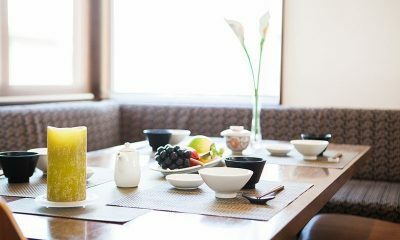 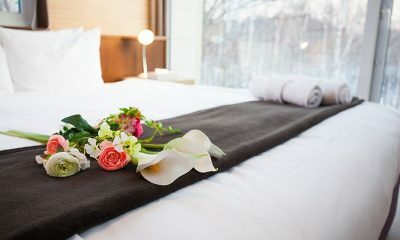 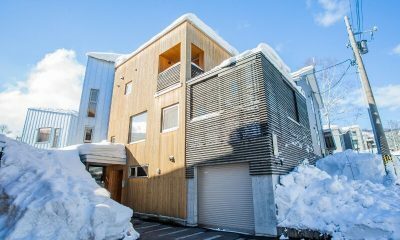 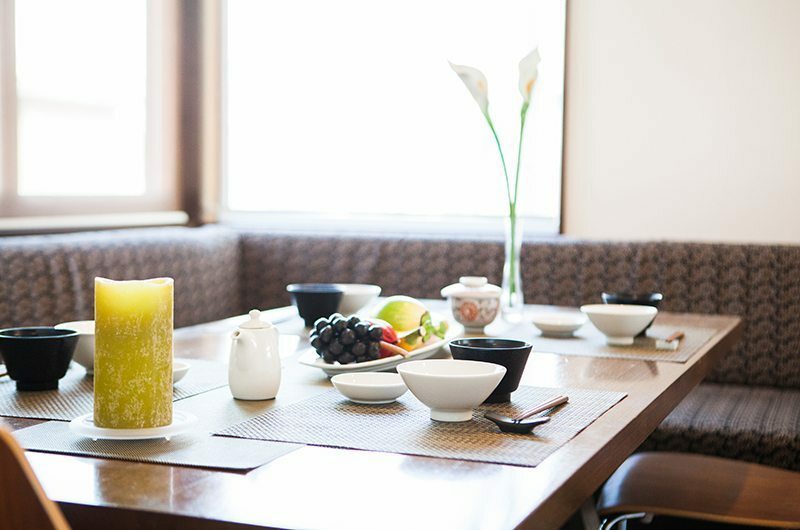 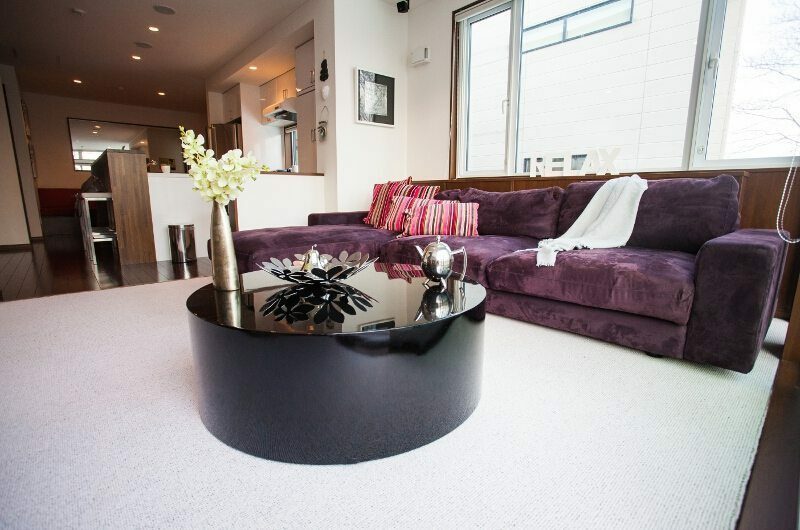 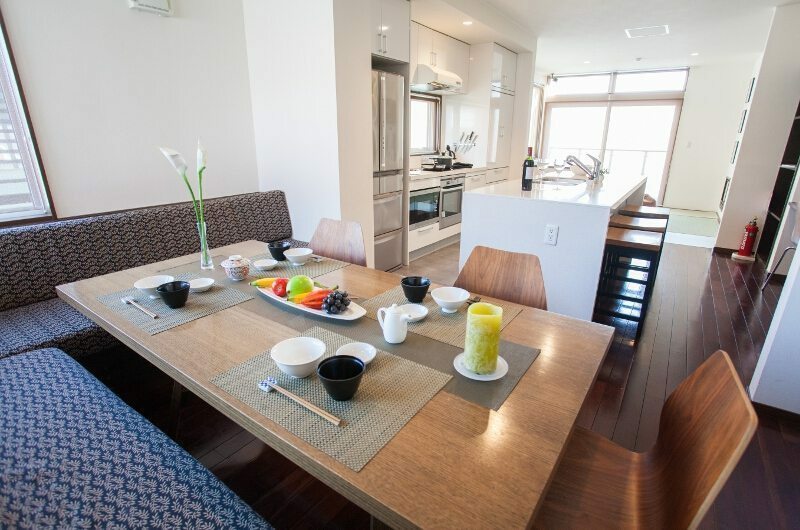 Toshokan Townhouses is a pair of contemporary ski chalets located in Hirafu ski village in Niseko, right along the streets which takes you up to the ACE family run. 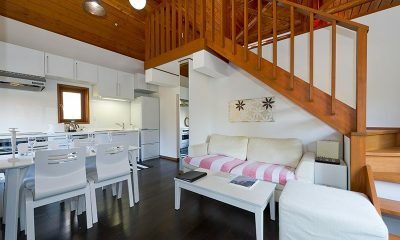 This is a great location, with plenty of restaurants and pubs within a short walk. 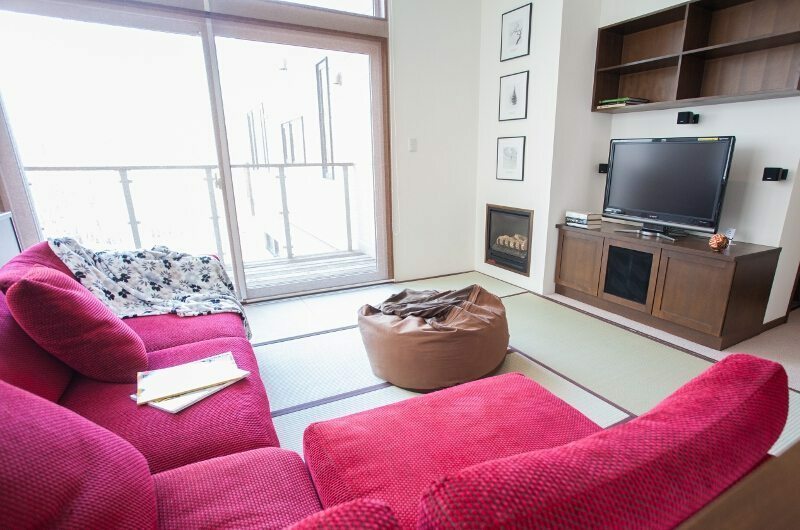 Although you’re close to the ski lifts, the even nearby ski shuttle stop will make getting there even easier. 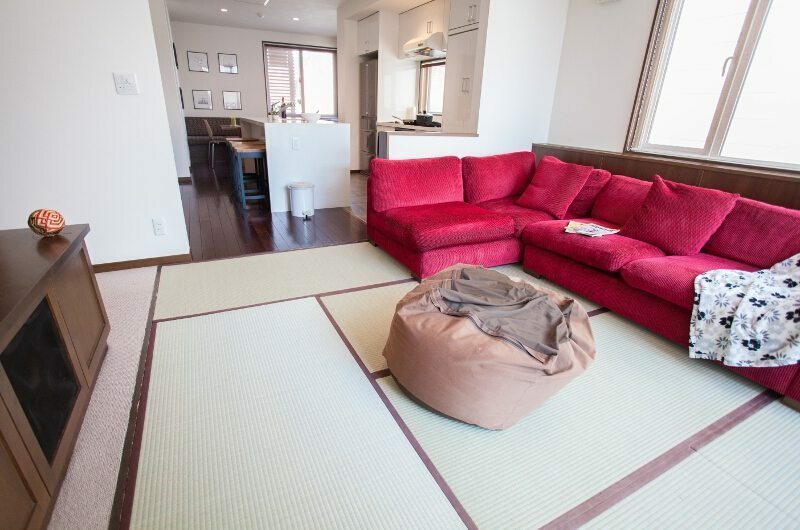 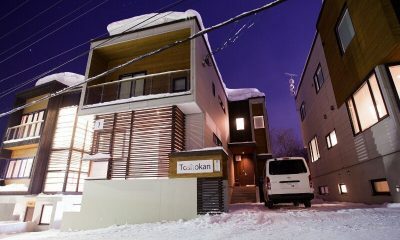 If you’re looking for more rooms close by, Toshkohan Townhouses is located between Neyuki Townhouses and Tamo. 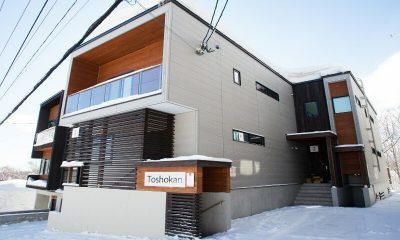 The two Toshokan chalets are contemporary in style and design, with generous windows offering natural light and snow-covered views. 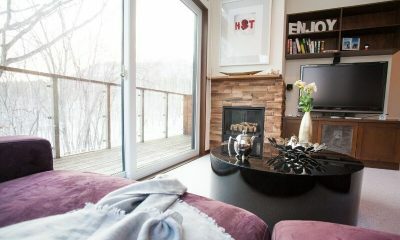 Each chalet has a basement level bedroom which doubles as a media room with a comfy sofa and a large TV. 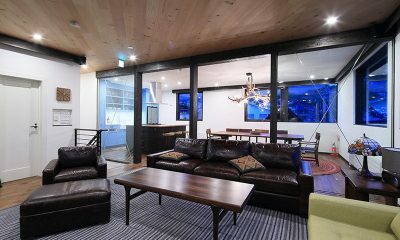 The living room in each chalet is strategically placed on the upper floor, allowing light to stream in unhindered through large windows. 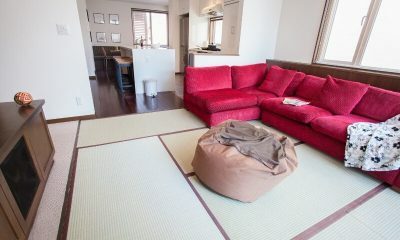 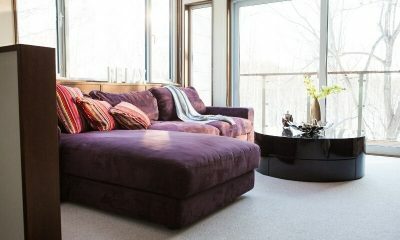 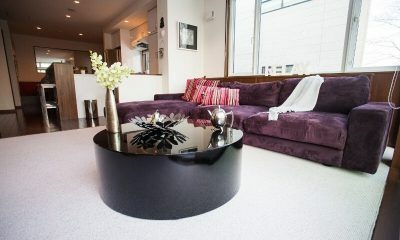 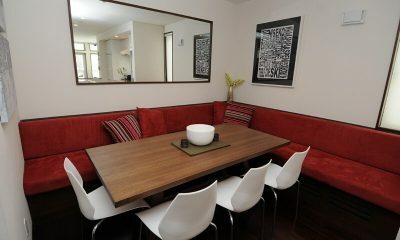 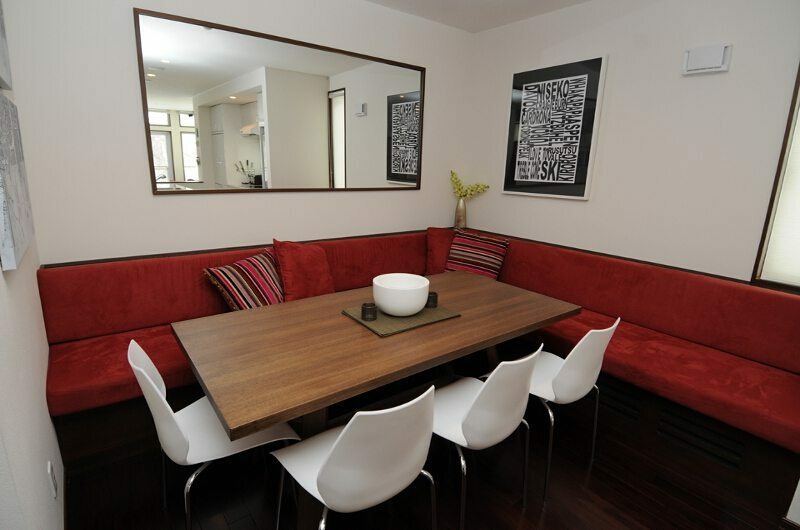 The living rooms are furnished with plush sofas and large TVs, offering the perfect setting for hanging out as a group. 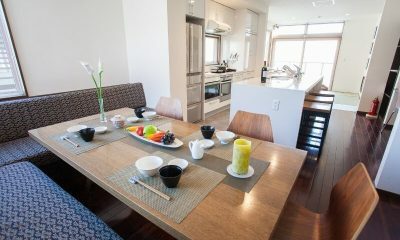 The dining area is a part of the middle-floor living room and features a spacious dining table surrounded by chairs and a L-shaped sofa, with an open-plan kitchen with all the necessary appliances adjoining the dining area fluidly. 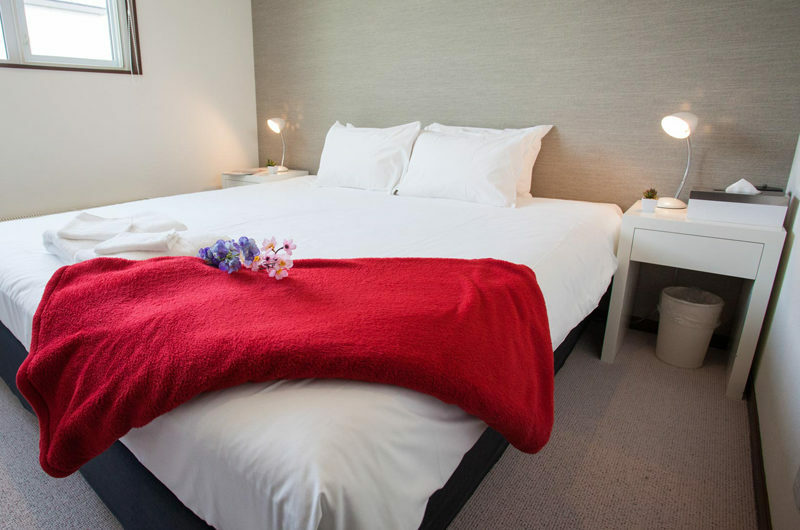 The first chalet has four bedrooms, all furnished with a split bed which can be set up either as a king-sized bed or two single beds as needed. 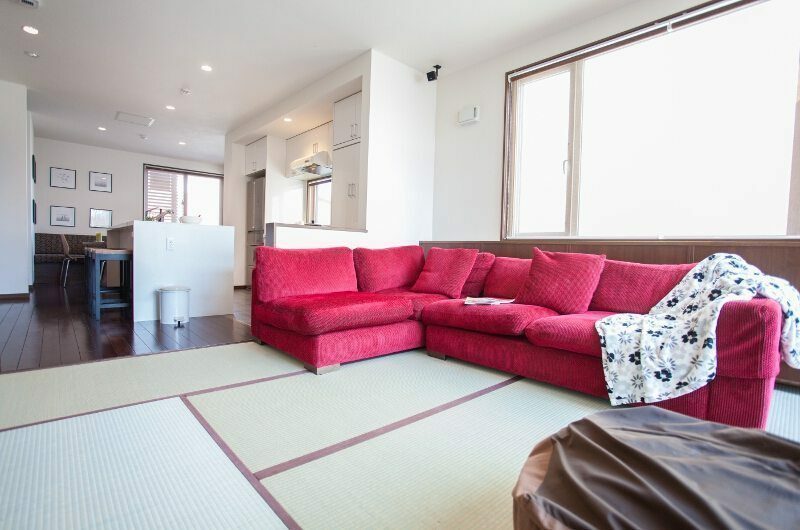 There are three bedrooms on the top floor and one bedroom is located on basement level. 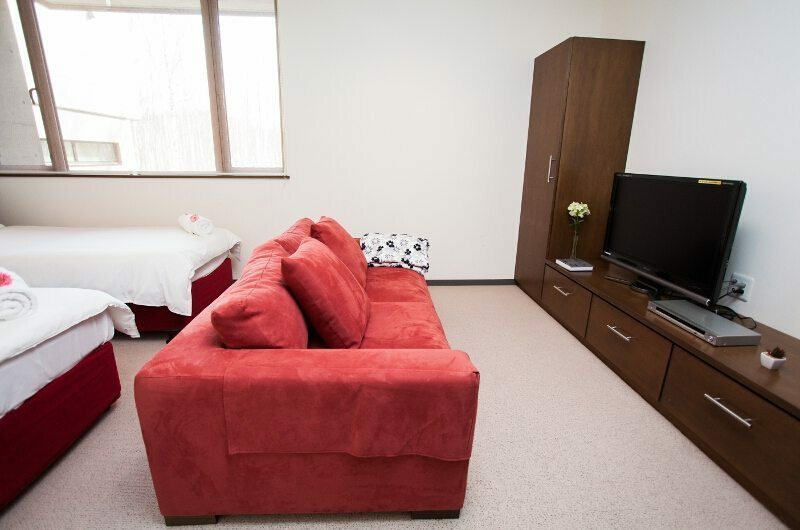 The first bedroom is located on basement level and doubles as a media room. 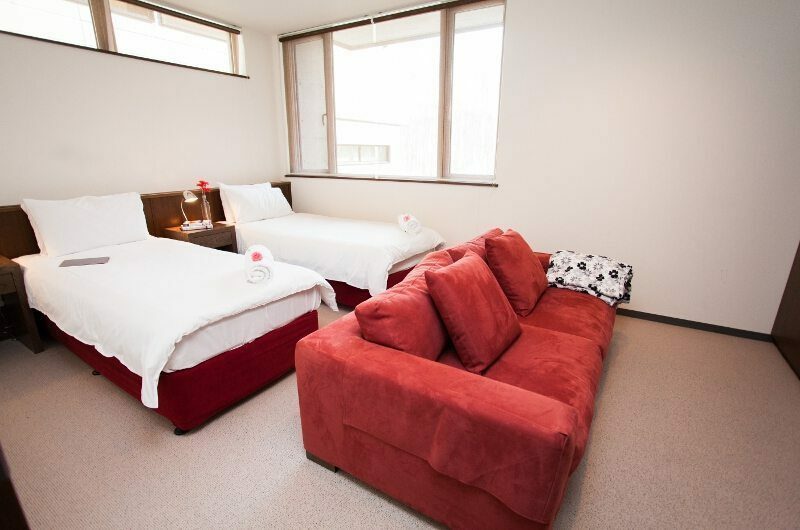 This room has a split bed and there is a shared bathroom right next door. 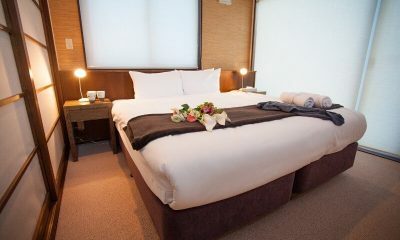 The second bedroom is the master bedroom located on the top floor. 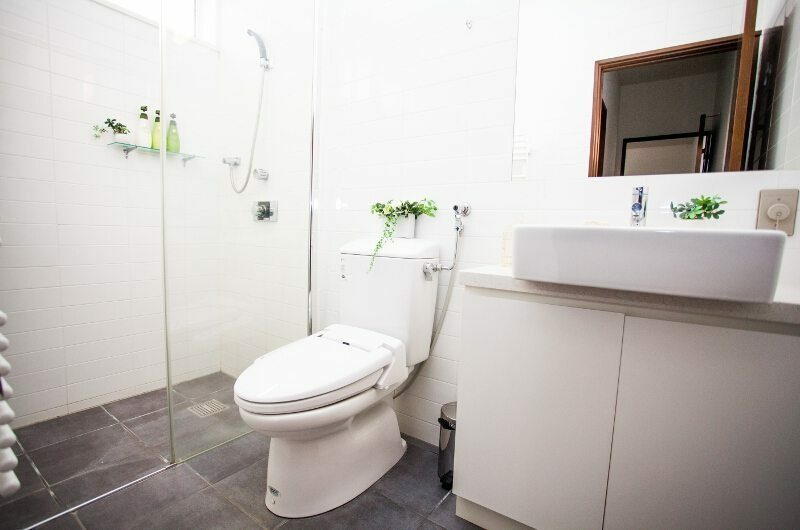 This room has a split bed and an ensuite bathroom with a shower. 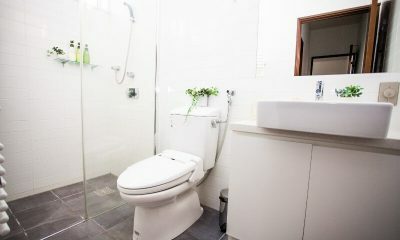 The third bedroom is also located on the top floor. 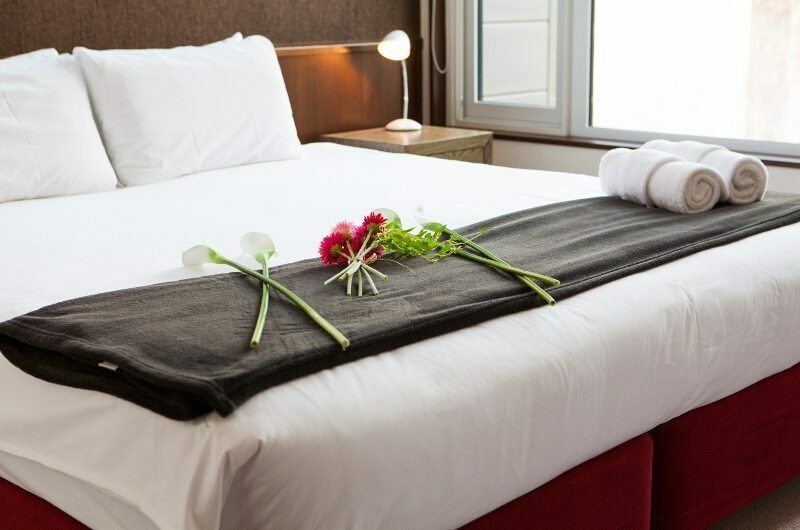 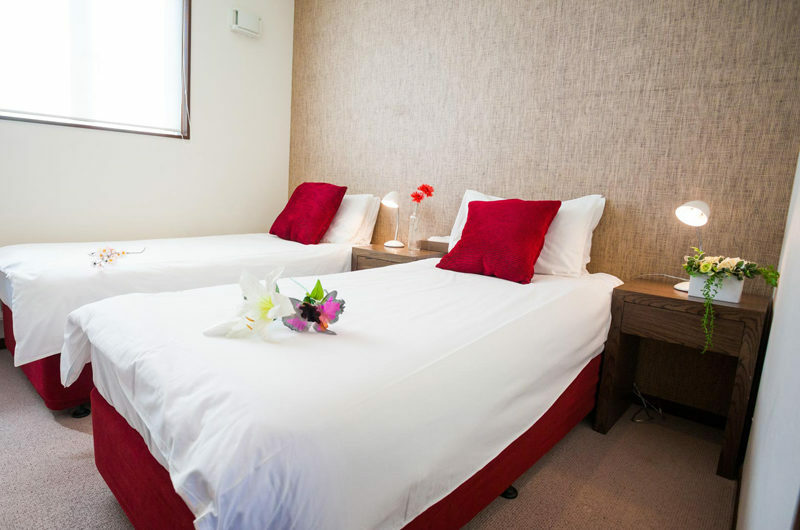 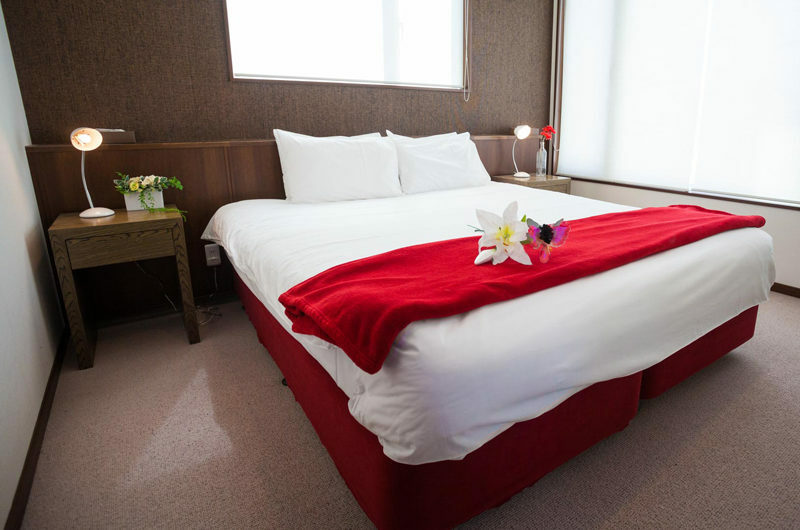 This room has a split bed and shares access to a bathroom and separate toilet with bedroom 4. 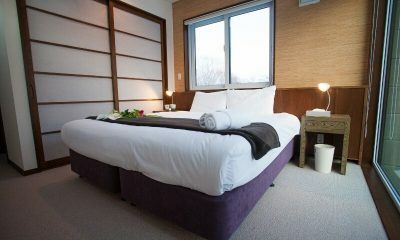 The fourth bedroom is also located on the top floor. 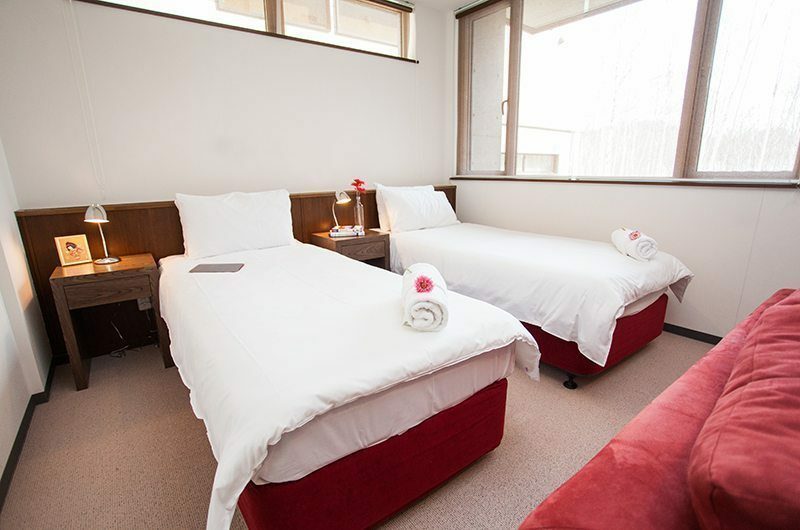 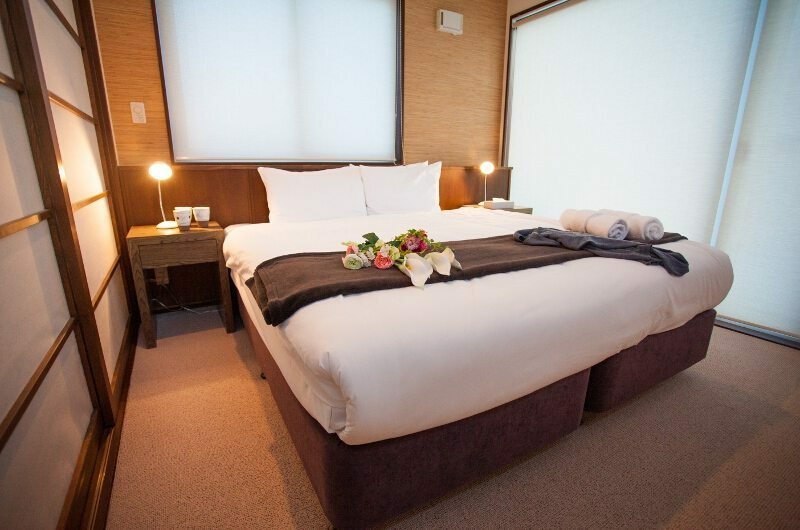 This room has a split bed and shares access to a bathroom and separate toilet with bedroom 3. 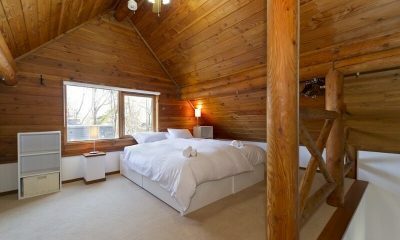 The second chalet also has four bedrooms, but the bedding configuration is slightly different. 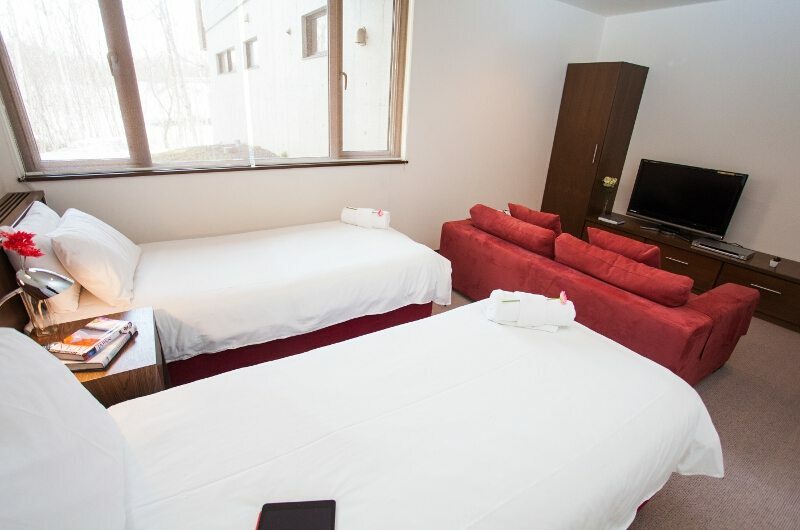 Three rooms have split beds (a king or two singles) and one room has a set of bunk beds. 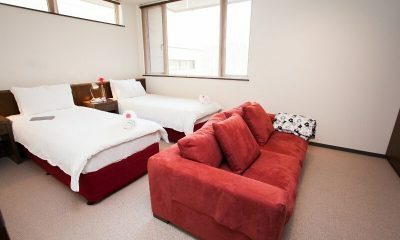 The bunk room is located on basement level while the other three rooms are housed on the top floor. 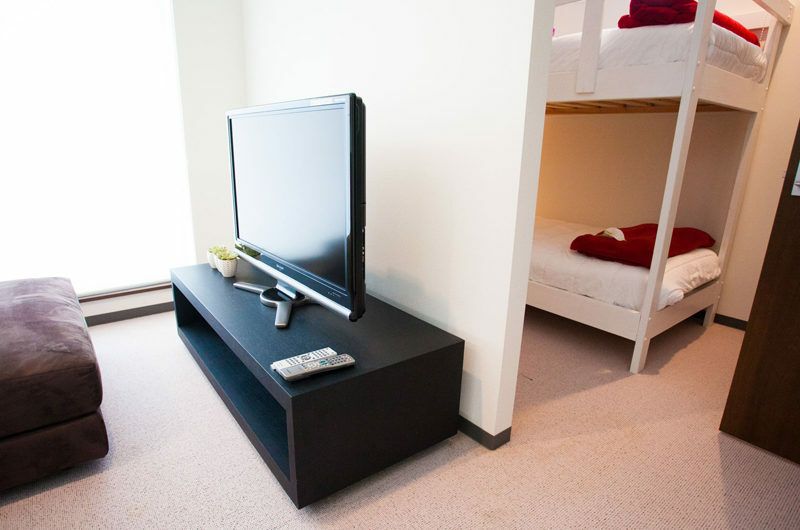 The bunk room is located on basement level and doubles as a media room with its large TV. 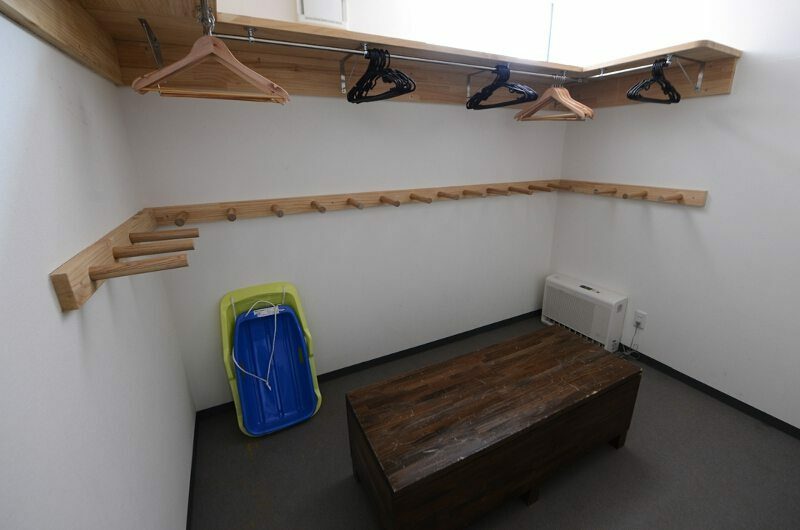 The room has a set of bunk beds with a bathroom located right next door. 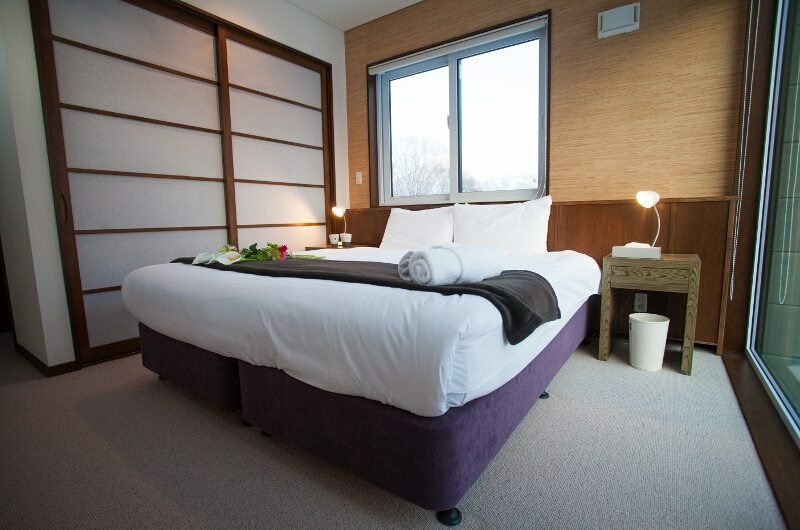 The master bedroom sits on the top floor and comes with a split bed and an ensuite bathroom with a shower. 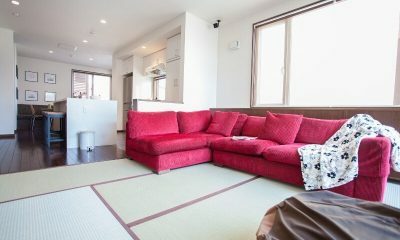 The third bedroom is also located on the top floor. 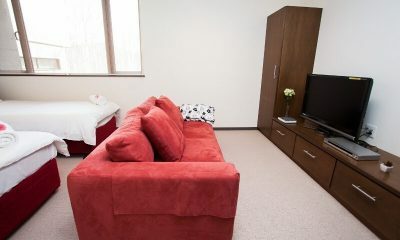 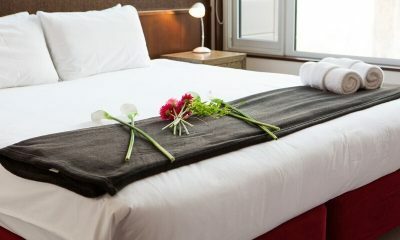 This room has a split bed and shares access to a shower room and separate toilet with bedroom 4. The fourth bedroom is also located on the top floor. 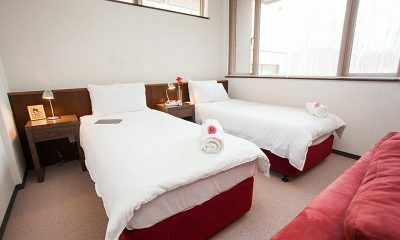 This room has a split bed and shares access to a shower room and separate toilet with bedroom 3. 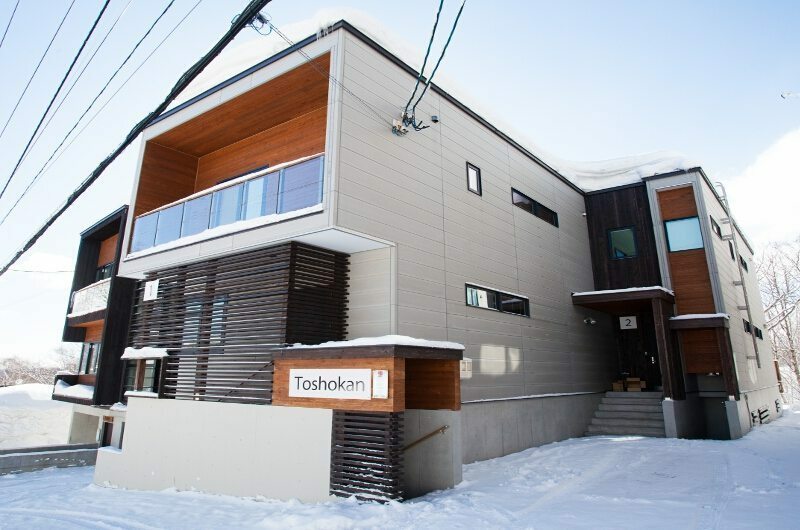 Each of the two Toshokan Townhouses spans three floors. 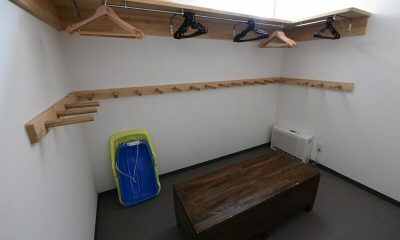 The lower ground floor houses one bedroom, the ski room and laundry facilities. 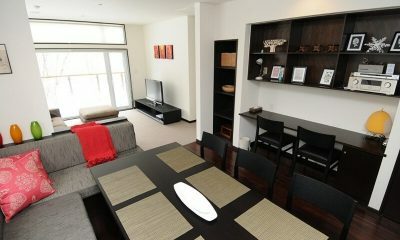 The middle level houses the living and dining areas. 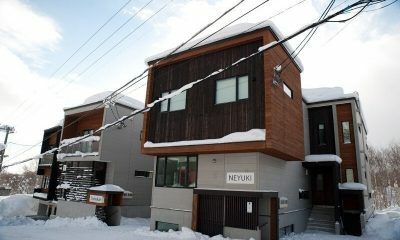 The top floor houses the remaining three bedrooms. 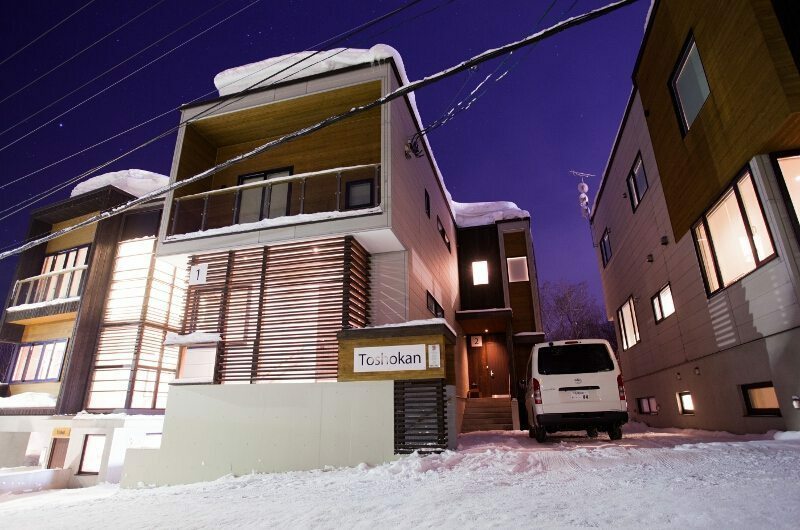 Toshokan Townhouses are located in Middle Hirafu Village in Niseko, Japan. 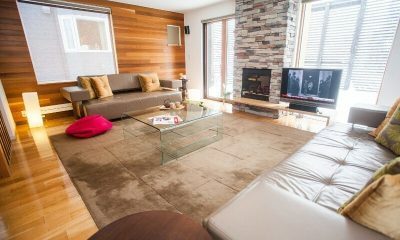 This is an ideal location close to all the action, with the ACE family run just a five minute walk away (though it might take a little longer with your ski boots on). 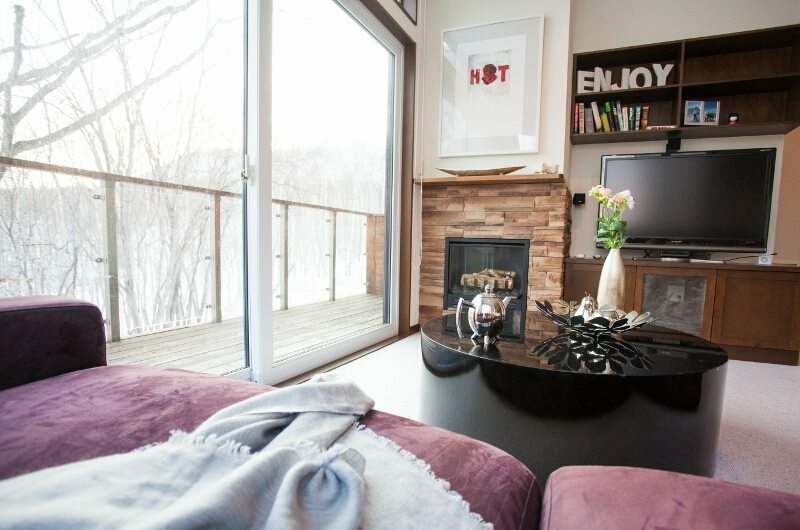 The nearby ski shuttle stop will make reaching the slopes that much easier. 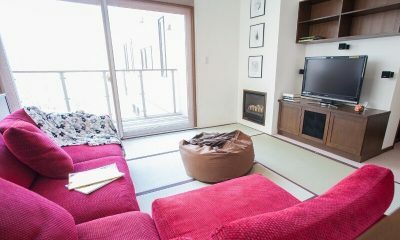 There are plenty of great restaurants within an easy walk and the famous Gyu+ (aka Fridge Door Bar) is right down the street.